A lot of us are driven to distraction by trying to discover those magical lucky numbers to unlock a lottery win. Different lottery fans swear by different strategies as they try and find the winning numbers. After all, the right set of digits can change our lives completely! But the fact is that the lottery draw is completely random, and every number has an equal chance of being drawn no matter how we come to choose them. Nevertheless, there are some approaches that are popular with Lotto fans, such as selecting personal lucky numbers or forming creative patterns on the betslip. A select few can even boast of having dreamt of their winning numbers. Is there really something to it, or is it just a load of old nonsense? We took a closer look at the subject of whether dream lottery numbers can really make dreams come true. One of the most common daydreams which many people have is that of winning a big lottery jackpot. It makes for a nice break from the boring housework or office routine when you allow yourself to imagine what would happen if your numbers came up. What would you do if you suddenly hit the jackpot? Buy a new house? Travel the world? Donate to charity? Or simply support your family and friends? One thing is clear though, with a lottery win in the millions you could get rid of financial stresses and worries in one go and make the rest of your life a whole lot more comfortable. Don't Dream about Your Life: Live Your Dreams! These daydreams can be very entertaining - after all, there are no limits to our imagination - but also quite productive. As we let our thoughts wander, we improve our social skills and our creative potential. At least this was the view that American psychologist Jerome L. Singer proposed in the 1960s. Other scientists have since come to the same conclusion, like brain researcher Jonathan Schooler of the University of California, who argues that creative daydreaming promotes problem solving and meaningful planning. But what if the big lottery prize or even lottery numbers appear in our dreams while we're sleeping? A recent opinion poll by Statista, a leading provider of marketing and consumer data, found that 9.6% of people dream of winning the lottery. Of those surveyed, an impressive 75% of respondents said they were convinced that they would eventually win the lottery. Psychoanalysts have long argued that dreams reflect our subconscious and our desires. In doing so they should act as a release valve through which we express the concerns, fears and needs that have built up in our daily lives. Sigmund Freud was famously of the opinion that our dreams are the fulfillment of suppressed wishes and desires. If you look more closely at the scientific study of dreams ('oneirology', to give it its proper title) you quickly realise that dreaming about winning a lottery in your sleep can have different meanings and causes. According to experts, the first question you should ask yourself after dreaming about lottery numbers is: "How in my life would I be able to make big profits from a small stake?" According to dream experts, when money in general appears in your dreams it stands for positive energy and feelings of power. In the interpretation of dreams we assume that a dream indicates the activity of our subconscious. Therefore, according to dream researchers, it could also be that this prepares us for a desired event and processes our unconscious fears before it enters our conscious mind. For example dreaming about lottery numbers could mean that you are worried about the consequences and big changes that a lottery win may bring. Many people believe in dreams which are a reflection of real life experiences - both past and future. Therefore, in dreams which feature a lottery win they see a hint to try their luck on the lottery in reality, and choose the lottery numbers that they dreamt about on the ticket. However, experts in the field of dream interpretation point out that the dream of winning the lottery can simply mean that the dreaming person does the lotto in real life and their dreams are merely a reflection of this. Therefore, as so often in dream interpretation, the image of winning the lottery is not directly transferable to reality. Although lotteries are generally associated with chance or luck, they can also be construed as a risk. At least that is the theory put forward by experts of dream interpretation. So, if we dream of winning a jackpot prize in the lottery, that would not necessarily be a positive omen. The lottery game may actually symbolise the uncertain outcome of a particular situation, such as a business venture, a relationship or a project. Experts suggest that we consider the possibility that our subconscious mind wants to warn us of potential financial or other losses (such as friendships or partnerships). In this sense, a well-known saying comes to mind: 'lucky at gambling, unlucky in love'. In short, dreaming about lottery numbers is no guarantee of winning an actual lottery prize. Of course you can try to use the numbers you dreamt about, just don't expect that your dreams contain some magical vision of the future. It doesn't matter if we choose birthdays and anniversaries or if we draw artistic patterns on the lottery ticket. All numbers have exactly the same chances of being drawn. Chance alone determines the outcome of a lottery draw. But what is certainly true is this: if you're not in you won't win! For most of us, winning a multi-million jackpot is nothing more than a pipe dream. Again and again, however, there are lucky people whose dreams of becoming a millionaire actually come true. Sometimes you even read about winners who have supposedly dreamt in advance of their lucky numbers and the resulting lottery winnings. Read on to find out more about three of those lucky individuals, whose dreams led directly to lottery success. Lottery wins depend on luck, of course, although there are ways to tilt the odds a little more in your favour. If you try more often and over a longer period of time, the chances of winning increase significantly. Endurance has lead to success in more than a few cases - Olga Beno is one person who could vouch for that. The lady from Nova Scotia (Canada) had a dream all the way back in May 1989 about lucky lottery numbers which resulted in a big win. Taking her dream as a sign, Mrs Beno started to play the lottery on a regular basis, using what she believed were the 'lucky' numbers she had dreamt about. Over the years, Mrs Beno occasionally won small sums of money, but never anything to write home about. Ten years ago, Olga suffered a severe stroke of bad luck when she was diagnosed with cancer. Shortly before the end of 2016, the woman from East Passage was facing financial ruin. The medical bills were growing and growing until the point where she was forced to sell her house. When Olga had just about given up hope, the unbelievable happened: those lottery numbers she had dreamt about almost 30 years earlier were finally drawn on the 28th of December. The determined dreamer had hit the huge jackpot of the Atlantic Lottery! As one of two lucky players, Olga was able to collect a profit of 5,366,704 Canadian dollars. The timing was really perfect! With her dream win, the long-standing cancer patient was not only able to pay her bills, but she was also able to afford to build a ranch-style house. Rarely has the term 'dream house' been more appropriate! As a way to say thanks to her family for helping her through the difficult times during her illness, the jackpot winner planned a trip to Disneyworld with her husband, children, and grandchildren. Dreaming of lottery numbers really paid off for Olga! The life of Deana Sampson was certainly no picnic, with 1998 being a particularly hard year for the mother of two. After having suffered through several deaths of close family members in a short period of time, her beloved brother Glyn also died. Compounding her sadness was the fact that she also had to deal with considerable money worries. On benefits and with less than a tenner in her bank account, Deana and her children in Sheffield were in quite a perilous financial situation. Then the unexpected happened, as this long-time lottery player finally got a big win, when on a Wednesday evening her lucky numbers came up in the lottery draw. Her perseverance had eventually paid off and she took home the jackpot of around £5.4 million (about €6.3 million). As the newspaper "The Mirror" reported, behind Deana's lottery win is a truly amazing story. "I think someone up there told me that something good was going to happen," the new millionaire told reporters in England, confessing that she dreamt of her deceased brother the night before the draw. He had reportedly told her she would win the jackpot, and that dream was to prove prophetic. At first Deana felt shock and panic about how to deal with such a grand prize, followed by the relief of knowing that she would finally be able to pay her debts. Once the initial shock subsided, Deana was delighted at the thought of how this stroke of good fortune would benefit her and her family. Accordingly, the first thing that the trained hairdresser did with her jackpot windfall was to buy a new house, and she then invited 22 relatives on a dream trip to Jamaica. A total of £1 million was given away by the 52-year-old to a combination of family, friends and charities. Deanna firmly believes in the saying "Happiness is only real when it's shared". If you won millions from the lottery would you quit your job? According to a study by Statista only about 37% would give up their job if they became lottery millionaires. On the other hand, 20% of respondents said that they would continue to work. The remaining survey respondents were more likely to reduce their working hours (28%), change jobs or pursue other activities (15%). The latter group also includes Deana Sampson. For the lively Englishwoman giving up work had never been an option, as she could not imagine sitting around at home and doing nothing. That would not be the example she wanted to give to her children. In addition, she has always liked the idea of ​​doing something charitable - whether through donations or by hiring people from her area to work in one of her many businesses. The lottery millionaire is now a successful businesswoman - she has invested in an online business and the hospitality industry, among others - and claims she still has her feet on the ground, the only difference is that now they are in better shoes! Just like her compatriot Olga Beno, Mary Wollens was a regular lottery player, and for the draw of the Ontario lottery on the 30th of September 2006 the 86-year-old widow had already gone for a Quick Pick with the lucky numbers 1, 10, 18, 24, 31 and 46. A few days before the draw was to take place, the Toronto pensioner had dreamt of a lottery ticket with her numbers and a big cheque. The dream was so vivid that Mary was convinced she had finally hit it lucky. Thinking to take full advantage of this positive omen, she set out to buy a second ticket with exactly the same numbers in order to increase her share of the jackpot prize as she was so confident of winning. Some people would say that it is a bit silly to buy two tickets with the same numbers, since the second one doesn't improve your odds of winning in any way. However, the former cleaning lady's gamble was about to pay off in a very big way when her numbers came up in that September 30th draw. As it turned out, another player - 64-year-old Ramon Sanz from Abbotsford - also chose the same winning numbers as Mary. Thus, the jackpot of 24 million dollars had to be shared. However, as the prophetic Lotto player had two tickets, she also garnered two-thirds of the grand prize: So she landed a double win, which was worth a total of 16 million! The multimillionaire also knew just how she was going to spend her winnings. Not content with simply having a new house in the same area, she decided that she wanted to move. What's more, she also started planning a trip to Las Vegas to see if her luck would extend any further. 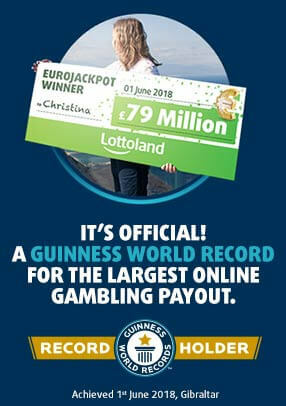 With us in Lottoland, you do not need to buy the same line twice in order to get a bigger win. With our special "Double Jackpot" feature you can make the most of any good fortune and double your potential lottery jackpot winnings! The interpretation of dreams is most certainly not an exact science, but the example of those winners suggests that if you do dream about lottery numbers it's worth giving them a shot! After all, Lotto is a game of chance and a little extra help, even if it comes from the dream world, may be just what you need.